2.3mm bead chain - buy by the metre. Aluminium pet tag sample pack. Brass pet & ID tags packs of 100. 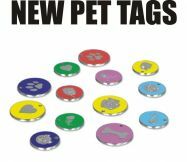 Collar tags for pets. Pack 20. 25mm nickel plated bone pet tags. 20mm cat design pet tags. 25mm dog face design pet tags. 25mm dog paw design pet tags.